Brief Description: Sydney Police are on high alert, as a cannibal serial killer is reported to have escaped the clutches of the New York Police and fled to Sydney, and, as a terrifying pattern of murders of young women begins in the city, their worst fears are confirmed. With very few clues and a sketchy suspect profile, it is down to Detective Guy John Shayd, aided by his psychic girlfriend and the Detective in charge of the case in the States, to track down their man before further atrocities are committed. Constantly one step behind the killer in a dangerous game of cat and mouse, their only hope is that Slaughterman’s overconfidence with lead to his downfall and eventual capture. 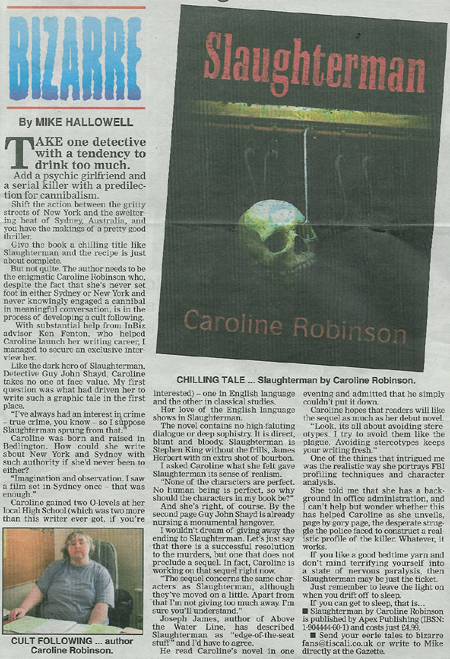 About the Author: Caroline Robinson was born in the town of Bedlington, Northumberland. She was educated at the local high school where she gained O levels in English Language and Classical Studies. Her previous jobs have included shop work and office administration. This is a fast moving read - powerful drama! I could not put this down - excellent writing and really enjoyed this to the end. 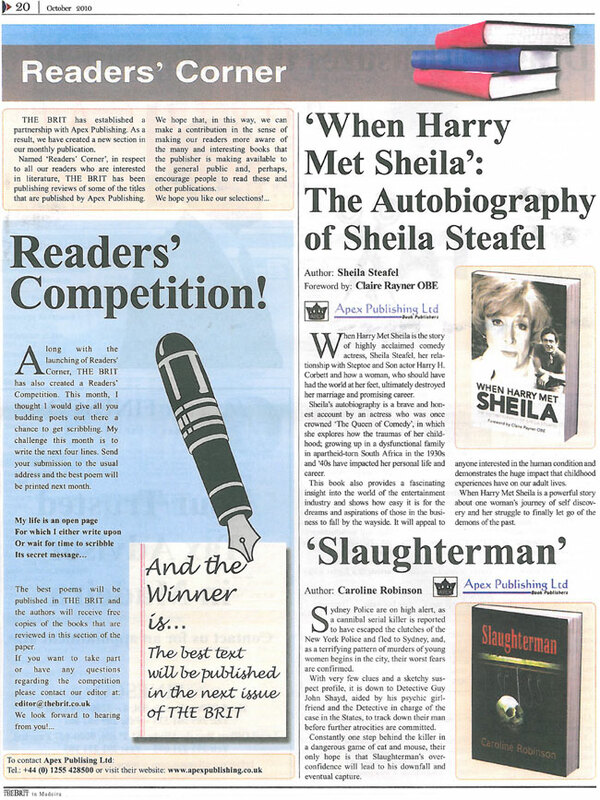 I found the writing style of Slaughterman to be clear, concise and to the point; and must congratulate the author on her recent success in getting published. Although I usually prefer a lengthier novel, I quite enjoyed the faster pace to Slaughterman, one which moved at an almost lightening speed. Some of the best parts of the book were when we got to see how the killer’s mind worked. I thought the depth of writing was at an all-time high during these short chapters. Likewise, some of the more interesting sections were when characters found themselves alone, which gave the author lots of creative manoeuvrability. At one point, however, I did think – how much bad luck can one serial killer have!? His sheer inability to keep the remains of his victims hidden did eventually have me rooting for him, as opposed to the two cops giving chase. The ending was well crafted, nail-biting and had me hooked. Not because I wanted to know who the killer was – I think most would agree by this point we all knew it was George Henry – but in the hope that Kay could locate the killer’s home before he slaughtered her cousin, Stevie. On the whole I enjoyed this book immensely, even counting the few plot oversights, and wouldn’t hesitate to read another novel by the same author. Congratulations Mrs Robinson on a job well done! A very enjoyable book. Edge of the seat stuff. This author has the makings of a great horror writer. I read this book in one evening as I could not put it down. A simple, engrossing, and fast paced thriller, with a relentless, remorseless, psychopath, and a couple of surprising twists. Nicely written, well done. Take one detective with a tendency to drink too much. Add a psychic girlfriend and a serial killer with a predilection for cannibalism. Shift the action between the gritty streets of New York and the sweltering heat of Sydney, Australia, and you have the makings of a pretty good thriller. 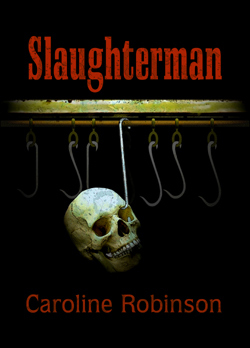 Give the book a chilling title like Slaughterman and the recipe is just about complete. But not quite. The author needs to be the enigmatic Caroline Robinson who, despite the fact that she’s never set foot in either Sydney or New York and never knowingly engaged a cannibal in meaningful conversation, is in the process of developing a cult following. With substantial help from InBiz advisor Ken Fenton who helped Caroline launch her writing career I managed to secure an exclusive interview her. This was a stroke of luck, as InBiz actually helped me launch my own media business last year. Caroline has never agreed to speak to the press before. Like the dark hero of Slaughterman, Detective Guy John Shayd, Caroline takes no one at face value. My first question was what had driven her to write such a graphic tale in the first place. Caroline was born and raised in Bedlington. How could she write about New York and Sydney with such authority if she’d never been to either? Caroline gained two “O” levels at her local High School (which was two more than this writer ever got, if you’re interested) – one in English Language and the other in Classical Studies. Her love of the English language shows in Slaughterrman. The novel contains no high-faluting dialogue or deep sophistry. It is direct, blunt and bloody. Slaughterman is Stephen King without the frills, James Herbert with an extra shot of bourbon. I asked Caroline what she felt gave Slaughterman its sense of realism. And she’s right, of course. By the second page Guy John Shayd is already nursing a monumental hangover. I wouldn’t dream of giving away the ending to Slaughterman. Let’s just say that there is a successful resolution to the murders, but one that does not preclude a sequel. In fact, Caroline is working on that sequel right now. Joseph James, author of Above the Water Line, has described Slaughterman as “edge-of-the-seat stuff” and I’d have to agree. He read Caroline’s novel in one evening and admitted that he simply couldn’t put it down. Caroline hopes that readers will like the sequel as much as her debut novel. One of the things that intrigued me was the realistic way she portrays FBI profiling techniques and character analysis. She told me that she has a background in office administration, and I can’t help but wonder whether this has helped Caroline as she unveils, page by gory page, the desperate struggle the police faced to construct a realistic profile of the killer. Whatever, it works. If you like a good bedtime yarn and don’t mind terrifying yourself into a state of nervous paralysis, then Slaughterman may be just the ticket. Just remember to leave the light on when you drift off to sleep. 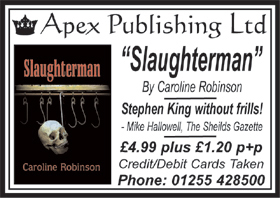 Slaughterman by Caroline Robinson is published by Apex Publishing Ltd (IBSN: 1-904444-60-1) and costs just £4.99. The book can be ordered online from Amazon or the Apex Publishing Ltd website.